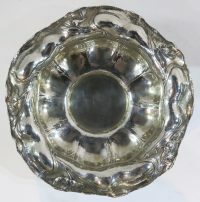 Gorham Martele, sterling silver Art Nouveau hand-hammered bowl. Retailed In Chicago by Spaulding & Company. 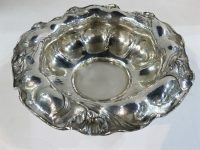 Round form, with typical pronounced hand-hammered surface and nouveau style flower decoration. 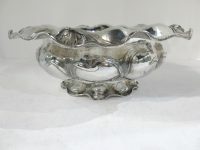 Bowl stands on a round pedestal foot. Hallmarked on the underside ss shown. 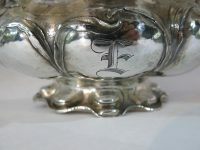 Hand engraved 'E' monogram on one panel Martele was an exclusively handcrafted range, whose name was derived from the French 'marteler' (to hammer) denoting the production technique used, ie hammered or handwrought. Martele was produced by Gorham from 1897 to 1930 under the guidance of William Codman. Codman being a fine English silversmith brought over in 1891 for this express purpose. 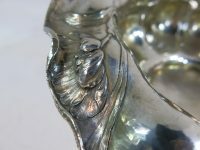 Due to the fact that all Martele silver was handmade, each piece tends to be unique in style. This example is in very good condition, with a beautiful planished surface. 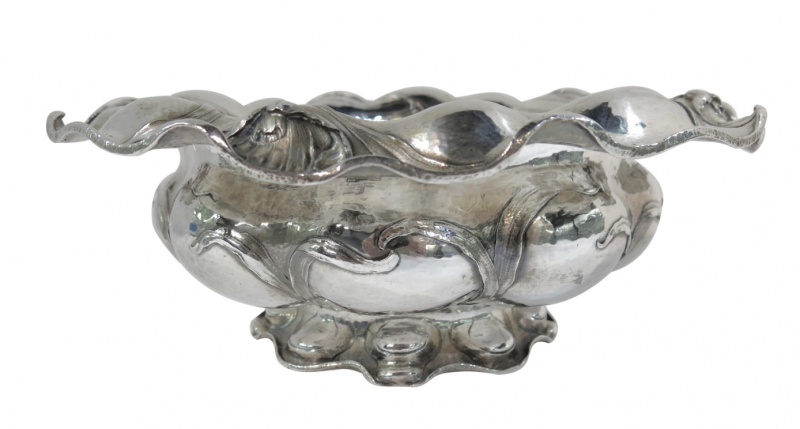 It has clear decorative detail and a very healthy patina. Practical size & shape for a multitude of uses, and decorative just as a centerpiece. Bowl is approximate 10.75" diameter x 4" high. Weighs 1,195 grams.